On Tuesday EWN started to run stories produced by the amaBhungane Centre for Investigative Journalism quoting the former Mineral Resources Minister Ngoako Ramatlhodi, who appears to have provided the missing piece of the puzzle that was set out by the former Public Protector’s State of Capture Report. Which means it must now surely be agreed by everyone: Ramatlhodi was fired so that Mosebenzi Zwane could put pressure on Glencore because the Guptas wanted their coal mine, and at a good discount. They really, really wanted it, and in South Africa these days what the Guptas want, the Guptas get. As a result, their well-placed drones are literally selling the country out from under our feet. Ramatlhodi’s story is a relatively simple one. In 2015 Ngubane and Molefe met with him, and demanded that he cancel the mining licences that allowed Glencore to operate in this country. All of them. And to keep them cancelled until Glencore gave up the Optimum Coal Mine. (It can be told in a much more complicated way, but that’s the bare bones of it.) The Optimum Coal Mine supplies Eskom with coal for its Hendrina Power Station. At the time, in 2015, the country was still reeling from load shedding. Ramatlhodi refused, partly because it would have led to more load shedding; if Glencore stopped all of its coal production, the entire country would have suffered. In a normal country (whatever that term may mean these days… but let’s assume one where accountability in government means something), a Minister would have told their President, who would have taken an immediate action. But not here. Not in a country where a serving deputy minister says in an affidavit that he was offered a bribe and the President himself says in public that he would take no action. 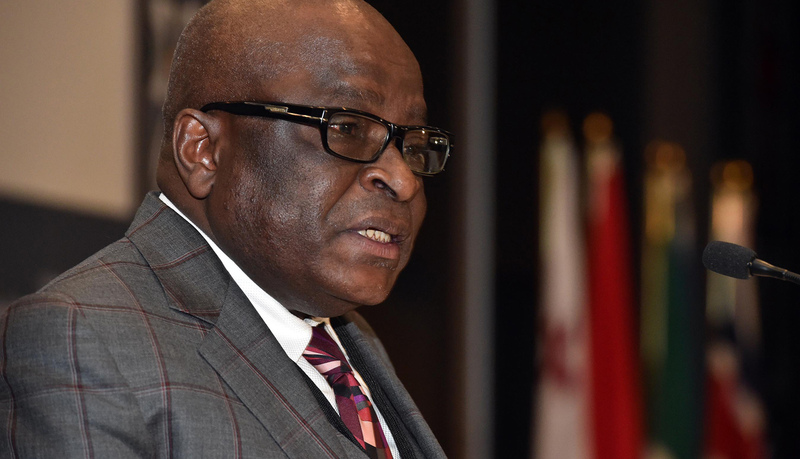 Instead, Ramatlhodi remained silent, and was moved to the position of Minister of Public Services and Administration. And then he was fired in the last reshuffle on the stroke of the last midnight of March. Of course, and for the record, and just for the record, Eskom’s board has, predictably, just denied it all, claimed it’s not true and generally hit the pompous button. Which is laughable, when you consider that just two weeks ago Ngubane confessed to never having seen the Carte Blanche interview in which his then acting CEO Matshela Koko was shown to have lied about signing a coal supply contract with the Guptas. There are many things to consider in all of this, about how power really works in this country, and how one family is bold enough to send someone to tell, or order, a Cabinet minister to break the law. First, we have to ask if what Ramatlhodi says is true. On the evidence that we have, it almost certainly is. Consider the context. Ramatlhodi was moved from Mineral Resources with great haste. It has been reported several times that as he was waiting for Zuma to tell him he was being moved, both Zwane and Duduzane Zuma came out of the room first (Duduzane Zuma of course works with, and seems to live with, the Guptas.) Zwane is a man with proven links to the Gupta family, and who has lied to the nation in the past to further their aims. Then we have what happened afterwards, which is spelt out in Thuli Madonsela’s lasting gift to the nation, her State of Capture Report. Molefe was in regular contact with Ajay Gupta during all of this time; he visited Saxonwold often. At the time Eskom was putting huge pressure on Glencore, and eventually Glencore, as big as it is, gave way. And don’t forget there is also the confirmation from Zwane’s spokesperson that Zwane travelled to Switzerland to help the Guptas seal the deal with Glencore. And yes, in the end, the Guptas did buy the mine, and control it now, and have the deal they wanted with Eskom. Meanwhile, there is a continuing tussle between Zwane and other mining groups over regulatory issues, and the way mining stoppages are ordered by government. In the end, Sibanye Gold won a case in which several mining inspectors were held personally liable for the cost of safety stoppages that were unnecessary. All of this points to a conclusion that Ramatlhodi’s claim rings true. But the question he faces is why is he speaking now, and would he still have spoken if he had not been removed from Cabinet. It must have been galling in the extreme, as a Cabinet Minister, and as someone with a long history in the ANC, to have been pushed around by Molefe and Ngubane. Ngubane doesn’t even have a history in the ANC, as he comes originally from the IFP. No one likes being pushed around, but those who fought in the Struggle particularly dislike it. That said, there was nothing at the time stopping him from speaking out immediately. Why he did not is for Ramatlhodi to explain. And explain he must. But at the same time, we must remember that those looking for good and bad and sharply delineated lines between black and white in this fight are going to be disappointed. Everything is shades of grey. Ramatlhodi’s actions are proof of that. But, when grey is all you’ve got, those who believe they are fighting pure corrupt evil are best advised to take it. Then we have the question, why has Ramatlhodi spoken now? He first broke his silence, sort of, on the Midday Report just before Pravin Gordhan was fired. He criticised his own leader in Zuma, and the state of the ANC. Then, after he was fired, he gave a brief interview to EWN. So, he’s been biding his time. The most important question to ask here for those uninterested in taking a holiday in December this year is whether he decided to speak now on his own, or whether this is part of something else, something bigger. It seems obvious now that more and more people who have secrets to share and have fallen out with Zuma are going to share them. For many, there is nothing left to lose, no MP’s salary, no party position, and no pride in being a member of the ANC. For others, the situation may be more complicated. But it would seem likely that as Ramatlhodi has now told us what happened to him, other people will be inspired to follow. It probably won’t be that long before we know. Because if this is organised, it may well be worth buying all of this weekend’s Sunday newspapers. And if they have something particularly juicy, someone might be planning something. Which could culminate in the ANC’s national executive committee meeting in 10 days time. Or, as is so often the case with the ANC, it may not. There are other questions for people in the ANC to answer too. Gwede Mantashe was supposed to run an investigation for the party into the claims of State Capture. Surely he would have spoken to Ramatlhodi. (Well, if he was serious about it.) And while relationships in the ANC can be difficult to pin down, surely if you are a Minister and in a situation like this and you can’t go to the President, you go to the Secretary-General? Which is what Mcebisi Jonas may well have done. And if that is the case, could Gwede Mantashe have always known, and is the time now just right?